Swivel-Tek’s owner for the past 5 years since her husband, John Essman, Swivel-Tek’s Founder passed away unexpectedly. Joyce has been involved the precision machine manufacturing business since she and John married in 1969. She embraced the opportunity to take over following John’s death and continues to make him and her family proud every day. Joyce enjoys spending time with family and friends and she has 2 daughters that help her with the business Stephanie and Coleen. Joyce also has 2 grandchildren, Kaiden and Finnegan. Swivel-Tek’s Director of Operations for more than 20 years, Scott is a very skilled machinist and proficient in set ups. Scott is knowledgeable in materials with regard to brass, steel and aluminum and keeps Swivel-Tek running 24-7, lights out. Scott’s rapport with our customers and availability is extremely appreciated and favorably commented on by our customers. Scott is married and has 3 grown children Andrea, Dustin and Chase and 2 granddaughters and 1 grandson. Doug joined Swivel-Tek in 2014 after spending more than 26 years with Power and Sons. 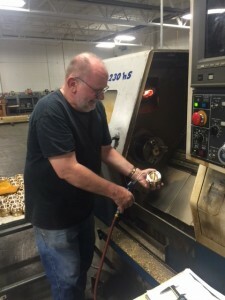 Doug excels in set ups, machining and machine maintenance. Doug is married to his wife, Julie and they have 2 children. In his spare time, he enjoys camping and the great outdoors. Ron has been a valued employee of Swivel-Tek since day one. He is an accomplished machinist trained in both multiple spindles and CNC and Swiss machines. Before joining Swivel-Tek he work at ARO for 10 years in their print shop. In his spare time, Ron likes to work on his cars. Ron feels the best part about working at Swivel-Tek is the laid back atmosphere. Janet has been with Swivel-Tek since it began and is our assembly guru. Janet is married to her husband, Dave and they have one daughter Amy. Janet enjoys spending her free time with her 2 precious granddaughters. Janet feels the best part about working at Swivel-Tek is the fact that she is always busy and never runs out of something to do. 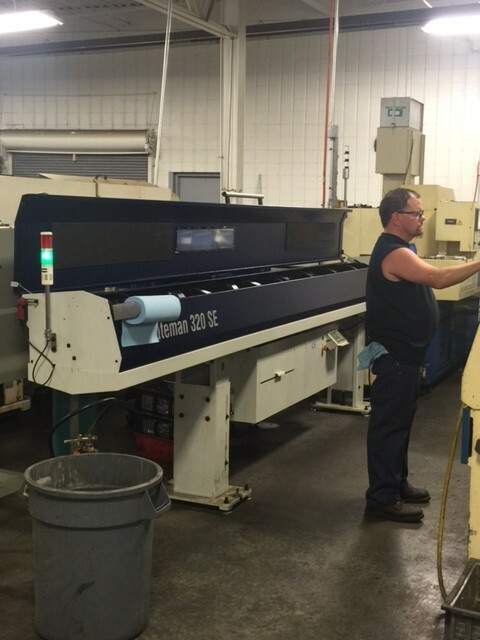 Phil has worked many years in the machine industry and he was one of John Essman’s loyal employees more than 20 year’s ago. Phil has worked as a quality inspector and he recently returned from “retirement” to help out in our assembly department . Phil has been married to his wife, Eia, for 45 years and they have 2 daughters Kimberly and Krystal. Phil’s hobby includes model trains and he enjoys spending time with his 5 grandchildren. Eia joined us with more than 30 years experience as a Quality Manager/Engineer in various industries. Eia’s focus area includes quality control and assurance with a special concentration on improvements and procedures. Eia joins her husband Phil at Swivel-Tek. As mentioned in Phil’s bio above, Eia and Phil have been married for 45 years and have 2 beautiful daughters and 5 grandchildren. Coleen Bridges is Swivel-Tek’s Director of Business Development. Coleen graduated from Oklahoma State University with a degree in Journalism and Broadcasting. While at OSU, she was a scholarship on Women’s Golf team. Following graduation, she worked as a publicist for NBC-TV working on hit shows such as “Friends,” “Seinfeld” and “Mad About You.” In 1998, she went to work for Swivel-Tek in a sales role where she stayed for 9 years. After leaving Swivel-Tek, she entered Pharmaceutical and Medical sales for 5 years before becoming a Practice Administrator for a start up Allergy/Immunology office that grew from 1 office to 4 in just 2 years. Coleen returned to Swivel-Tek in May of 2016 in the role of business development. She has been married to her husband, TJ, for 20 years and has a 14 year old daughter named Kaiden and a 8 year old son, named Finnegan.